"Bulky presents under the Christmas tree are no longer enough: young Britons expect to be given adventures and days out that will gain them likes on social media, research has found." Excerpt from the Times newspaper 26/11/2018. 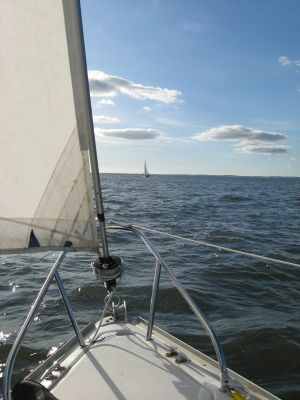 What about a gift voucher towards a 2-day sailing course on a small yacht on Morecambe Bay? We all know people who say they'd love to have a go at sailing. You could make their dream come true. My family for my 71st birthday treated me to a "fun sail" with The Bay Sailing School, I was a little bit nervous but needn't have worried because John and Deirdre were so welcoming and friendly and talked through everything we needed to know and do. It was such a warm and sunny day, Deirdre was "the skipper" and soon had us doing "the ropes". It was such a grand experience I would recommend to everyone. A few weeks later I got an E mail inviting me to watch Lily the beautiful boat coming out out of water for the winter. I went up to Morecambe and ended up helping, again John and Deirdre were very friendly and I didn't feel I got in their way. I shall be putting "fun sail" on my Christmas list.